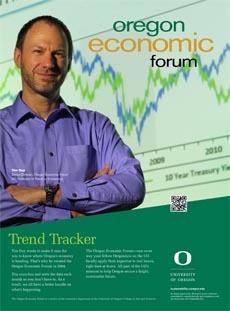 First: Final days to register for this year’s Oregon Economic Forum! You won’t want to miss our exciting lineup of speakers this year! For more information, click on link below. This wouldn’t have unfrozen credit markets, but it would have kept things on the right side of apocalyptic. Although even then “some of the big mortgage lenders and regional banks that were more directly affected by the mortgage meltdown likely wouldn’t have survived,” University of Oregon economist Tim Duy told me. Think Washington Mutual and Wachovia. That notwithstanding, the idea is that the rest of the banks would have gotten the time they needed to earn their way out of their problems without needing government help. That might sound overly optimistic, but it might have been feasible. While the banks were in a lot of trouble, it wasn’t nearly as much as the post-Lehman “fire sale dynamic,” as Geithner put it, made them look. Avoiding the panic might have let us avoid the bailouts. Tim Duy, an economics professor at the University of Oregon, said this messaging is being interpreted “fairly dovishly” by markets, even though the robust economic data ought to be pushing the Fed in a fairly hawkish direction. “The economy is in the midst of a strong cyclical rebound, with a fiscal stimulus, which creates enormous economic momentum. The risk is that eventually investors suddenly wake up and realise the Fed is going to have to clamp down with much tighter policy. That message doesn’t seem to be getting through — maybe it is because Powell is not being clear enough,” said Mr Duy. Fourth: Below is the University of Oregon State of Oregon Economic Indicators for August 2018. Special thanks to our sponsor KeyBank! Please be sure to download the full report – now expanded to include additional charts of the economic measures used to construct the UO Index. The moving average measure, which smooths out the volatility, stood at 0.83, well above average (“zero” indicates average growth over the 1990–present period). The manufacturing sector made a negative contribution, with hours worked again a particularly weak spot (the employment component was also negative but that tends to be more volatile). Although job growth slowed, the unemployment rate, however, reached a record low of 3.8 percent in August, and low initial unemployment claims, a forward-looking indicator, suggest job growth will rebound in the months ahead. The University of Oregon Index of Economic Indicators held steady in August. Underlying data was mixed. Employment services payrolls look to be normalizing after experiencing a steep run-up and subsequent decline over the past year. Building permits, smoothed, declined again as the market adjusts to a slower pace of multi-family construction. Manufacturing average weekly hours worked fell again. Traditionally this tends to be a very cyclical indicator, but in this instance the indicator is deviating from national manufacturing numbers which reveal a strong pace of activity. Moreover, the declines appear to be concentrated among production employees. This may reflect new workweek limitations for Oregon manufacturing firms and as such would not indicate a cyclical shift in the economy. Together, these indicators suggest ongoing growth in Oregon at an above average pace of activity. Recent declines in the UO Index are not sufficient to raise recession concerns.